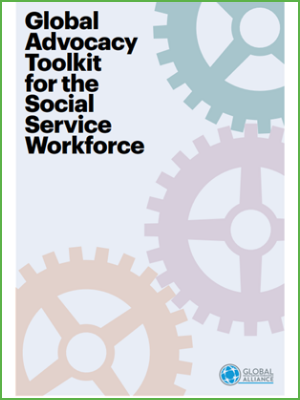 The Global Advocacy Toolkit for the Social Service Workforce from the Global Social Service Workforce Alliance focuses on creating a common narrative to advocate for social service workers. The toolkit was developed through a series of interviews with experts in the field, as well as through desk research. Advocacy – What works when talking to policy and decision-makers? How do I create a context-specific advocacy outreach plan? Developed with insight from global experts, the toolkit can be considered a resource for outreach in many settings. The Global Advocacy Toolkit was specifically designed to help the workforce in different settings and allow for localization as needed. It provides tools and tips helpful for developing and implementing an advocacy plan, including how to set up objectives, choose the audience, decide and elaborate the main messages, select the advocacy tools, develop a press release, accompanied by useful examples.